All fruits contain naturally occurring sugar, but finding fruits low in sugar can help you cut calories significantly and keep blood sugar levels in check. Getting too much sugar in your diet means you may be lacking other essential nutrients and puts you at risk for becoming overweight or obese. Furthermore, if you have diabetes, controlling your total sugar intake is a must. Technically, there is no specific definition for low-sugar foods, and "low-sugar" isn't allowed as a claim on food labels, according to the American Diabetes Association. However, certain fruits are much lower in sugar than others. Generally speaking, low-sugar fruits provide fewer than 10 grams of sugar per serving (1 cup), while high-sugar fruits may contain up to 25 grams of sugar in the same portion. Keep in mind that not all low-sugar fruits are low in calories, but many of them are. Coconuts aren't low-calorie fruits, but they are low in sugar and an excellent source of dietary fiber. A cup of shredded coconut contains 283 calories, 7 grams of fiber, and just under 5 grams of sugar. Like coconuts, avocadoes are fruits that are high in fat and calories but low in sugar. A cup of sliced avocado provides 234 calories but less than 1 gram of sugar, according to the U.S. Department of Agriculture. The fats in avocados are mainly monounsaturated, making this low-sugar fruit an excellent choice for heart disease risk reduction and blood sugar control. Fresh cranberries taste tart, but these nutritious fruits are low in calories and sugar. A cup of whole cranberries provides you with just 46 calories and 4 grams of sugar. While lemons are difficult to eat raw, they can be used as flavor enhancers in water or tea without using added sugar. A cup of raw lemon pieces contains 61 calories and 5 grams of sugar. Similar to lemons, limes contain about 60 calories and 3.5 grams of sugar per cup -- making limes excellent flavor enhancers without the added sugar. Technically a vegetable but often thought of as a fruit and combined with fruits in recipes, raw rhubarb is very low in calories and sugar. A one-cup portion of rhubarb contains just 26 calories and 1 gram of sugar. 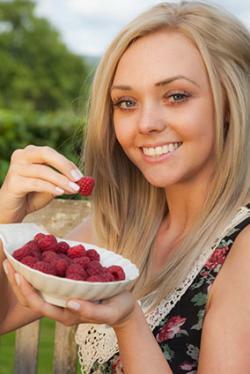 While raspberries taste delicious, they contain just 64 calories and 5 grams of sugar per cup -- making this sweet treat an excellent choice for dieters and diabetics. Blackberries are slightly higher in sugar than raspberries, but still fairly low in sugar. One cup of blackberries provides you with 62 calories and 7 grams of sugar. A cup of sliced strawberries only contains 53 calories and 8 grams of sugar, making this delicious fruit an excellent choice for weight and blood sugar control. If you love watermelon but are worried about your sugar intake, you're in luck. While watermelon is slightly higher in sugar than other low-sugar fruits, it contains just 46 calories and 9.5 grams of sugar per cup. Casaba melon is similar to cantaloupe and honeydew melon, but is lower in sugar. This nutritious melon contains 48 calories and 9.7 grams of sugar in each one-cup portion. Adding low-sugar fruits to your meal plan means you can still enjoy the sweet taste of natural sugar in fruit without significantly boosting your blood sugar and insulin levels. Many low-sugar fruits are also low in calories, which is a must when you're trying to shed pounds.